A dispatcher on the Chicago Police Department radio channel used to request K-9 units held the air Sunday morning and asked everyone to stand by. 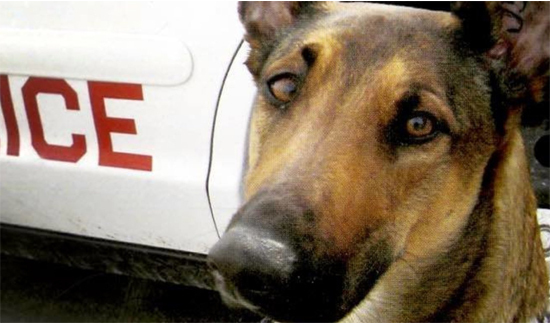 When her handler, Officer Charles Kocanda, heard the dispatcher read out his beat number, he went to reach for his radio, which he didn’t have. Then he heard they were asking for the dog by name. Kocanda worked with Rachel for 10 years. She was trained to detect explosives by the Transportation Security Administration and assigned to Chicago. A sudden onset of cancer in her spine left her partially paralyzed, and she was put down Sunday morning. The dog has protected the president, first lady and foreign dignitaries. She searched fire trucks and St. Rita before the funeral for Chicago firefighter Daniel Capuano, who died in a fire last year. She rode the trains and buses with Kocanda. She knew when it was time to work, and she would wait at the door for Kocanda before each shift. If he had on his dark uniform, she knew she was going to work. If he wore his blue shirt, she knew she was staying home and waited in the window for him.